The Queen is the most powerful piece in the chess army. She combines the power of both the Rook (straight lines) and the Bishop (diagonals) as illustrated in Diagram #1. The Queen can reach a maximum of 27 squares in all directions. Imagine a long-range weapon being able to fire accurately in all directions! While the Queen can bring destruction to an enemy position, she is also to be protected. In the open board the queen is powerful, but in crowded positions, she can be assaulted and even trapped by lesser pieces. When capturing an enemy piece, the Queen captures the piece by moving the piece and taking control of the square. In Diagram #2, you can see the power of a centralized Queen and it far-reaching abilities. The Queen's power is clearly realized in open positions, and because of its scope, it is always a threat to inflict serious damage on the opponent's position. 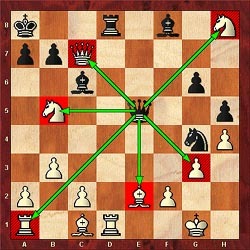 One caution is do not to abuse the power of the Queen by moving it within the first 4-5 moves. Develop your minor pieces (Knights, Bishops and Rooks) first! Quick checkmates rarely work and will leave your Queen dangerously exposed. There are many traps lurking at the hands of minor pieces which can often gang up on the Queen. 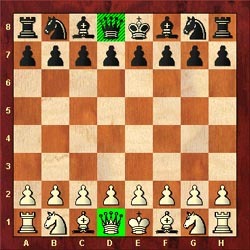 Three or four well-coordinated minor pieces can easily overpower a Queen. So be careful with the Queen! Some of the best positions for the Queen are those that support or strengthen the minor pieces. This is called a "battery" just like someone battering the door down. 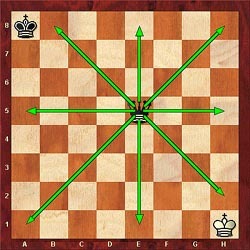 In Diagram #3, you see the Queen can conduct a battery by supporting the Bishop and the doubled Rooks in an attack on the f7-square by moving to the f1-square. The Queen is sometimes better placed behind the minor pieces. 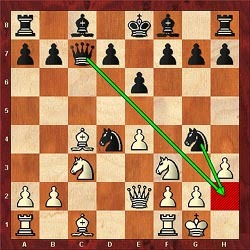 A more devastating battery would occur if white moved its Queen to the a1-square attacking the defenseless g7-square. 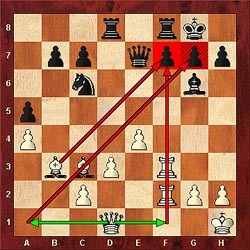 In Diagram #4, this well-known position demonstrates the Queen working with the knight on g4 to form a devastating battery on the white King. A battery is one of the first tactical themes learned by most beginners.